Welcome back for another challenge with Cardz TV Stamps with Mary. This week's challenge is called It's a Guy Thing. I don't know about you, but I never have enough of these kinds of cards on hand for those special guys in my life. I was glad to make a guy card this week. It will be the the first of many. Between brothers, cousins, BIL, father, FIL, I am sure I will be busy this year. So ladies this challenge was made for you. Please join us for this week's challenge. Just link your card and you will have the opportunity to win a set of Mary's wonderful stamps. I can't wait to see what you have created. Comments are welcome. Enjoy and GOD Bless! Love how this card turned out. Perfect Guy card. Nice card how fun. Perfect timing with super bowl coming up. The mesh gives the football appearance, great job. You did a really great job on this card, I just love the textures and the colors. Just perfect! This came out awesome!! Any guy would love this! Great job. I just love this card, your so creative!!! That's a great card. I never have any guy cards in my stash so I will make some this weekend. Wow, such an awesome card! WOW! What an awesome card! 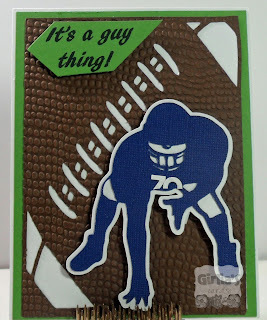 The football background is fabulous and I love the embossing! Gloria love the look of the football it's amazing how real it looks! Touchdown! Perfect for this time of year. Any football fan would love it! Hope you will stop by and see my stick pin pictorial. Let me know what you think! Love this, the football looks so real! Awesome! Masculine cards are often difficult to create. Thank you for showing me how to think outside the box. Always love your work. Thank you for sharing. Wow. Great job. Love the background paper. It really looks like a football. You really did a fabulous job with this card!! 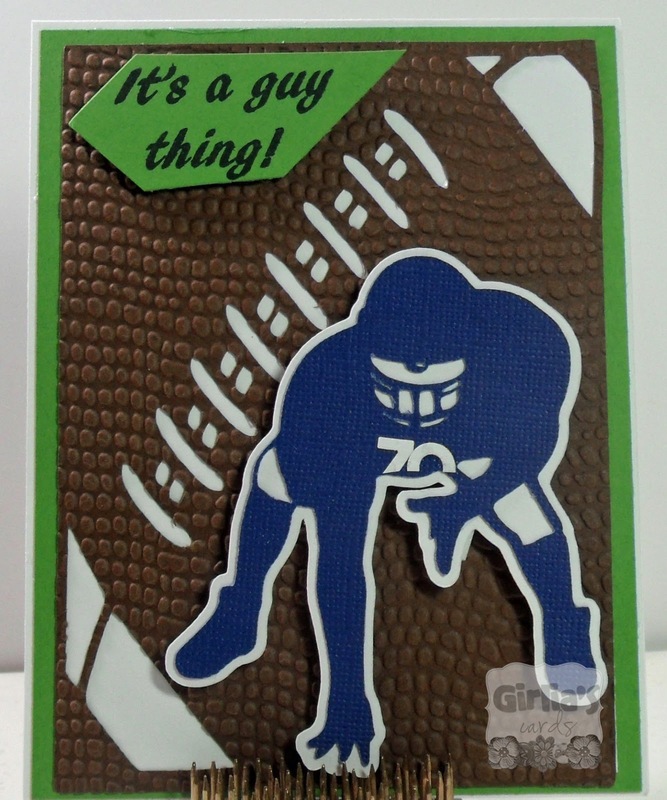 The embossing you added really makes that background look like a football. Fantastic card!! This is a great card, the embossing on the football looks so real!!! Wonderful, the embossing is perfect!! Oh my goodness I simply LOVE this!!!! Thank You Card and a Winner! Happy Blogaversary and New Year!